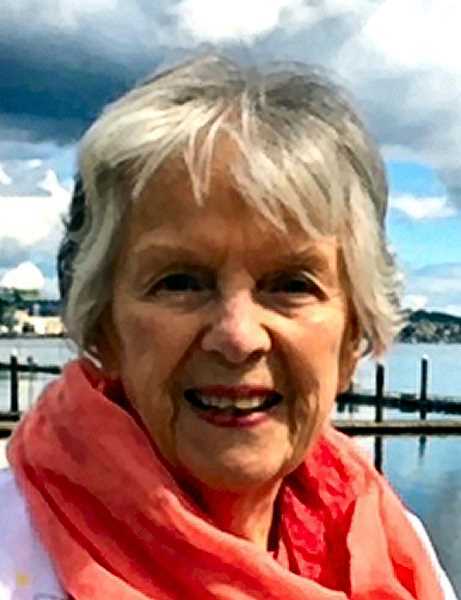 Nancy Ann Rusher Musgrove Schmid was born in Albany, Oregon, on November 18, 1928, daughter of Glenn Odell Rusher and Hermion Darling Rusher, and was raised in Tillamook, after the family moved there. She attended Oregon State College, as the University was then known, and then graduated from the University of Oregon College of Nursing. She was a member of the Alpha Xi Delta sorority. After graduating from the College of Nursing, she married Lt. John D. Musgrove, USAF, on June 17, 1951 in Eugene. The couple transferred often to follow his career as a jet pilot in the Air Force. They lived in Japan, Okinawa, Arizona, Wyoming, Georgia, Alabama, Louisiana, South Carolina and Tampa, Florida. They had three children: Doug, Johnny, and Becky. Capt. Musgrove was killed in action in South Vietnam on October 4, 1965. He was interred with full military honors at Arlington National Cemetery, and posthumously promoted to the rank of Major. He received the Silver Star and the Purple Heart. In her own career as a nurse, Nancy worked over the decades at Sacred Heart Hospital in Eugene, Centro Asturiano Hospital in Tampa, and in various doctors' offices. She also worked for the Visiting Nurses Association and the American Red Cross. Nancy married William Arthur Schmid on June 21, 1972, in Tampa. They moved to Clinton, Mississippi in 1978. Mr. Schmid passed away March 1, 2017. Nancy returned to her home state in June of 2017 and enjoyed a year of special time with her children (all West Coast residents) and many other friends and family members, while an active resident of Brookdale Sellwood (now Elmcroft Sellwood). She moved to a small adult care facility in Milwaukie in late June of this year, and passed away at the age of 89 on July 5, of heart failure. Ms. Schmid is survived by her children and their spouses: Douglas Musgrove and Harriet Hardiman of Portland; John Musgrove and Christina Murphy of San Francisco; Becky and Steve Irby of Port Orchard, Washington; four granddaughters: Alexandra Irby (Scott Daigle), Carly Irby, Hazel Kleingrove, and Ivy Musgrove – as well as two great-grandsons, Logan and Leo Daigle. The family notes she was also survived by her cat, Coquette. In addition to her two husbands, she was preceded in death by her parents, her sister Jane Leonaitis, her sister-in-law Kay Musgrove, and her nephews John Steinbach and Tymen Steinbach. A memorial service was held at Musgrove Family Mortuary Chapen in Eugene on August 25. Memorial donations may be made to the Episcopal Church of the Creator in Clinton, Mississippi, or to Bailey's Bones and Wishes in Portland.